LVL is produced by bonding thin wood veneers together in a large billet. The grain of all veneers in the LVL billet is parallel to the long direction. The resulting product features enhanced mechanical properties and dimensional stability that offer a broader range in product width, depth and length than conventional lumber. 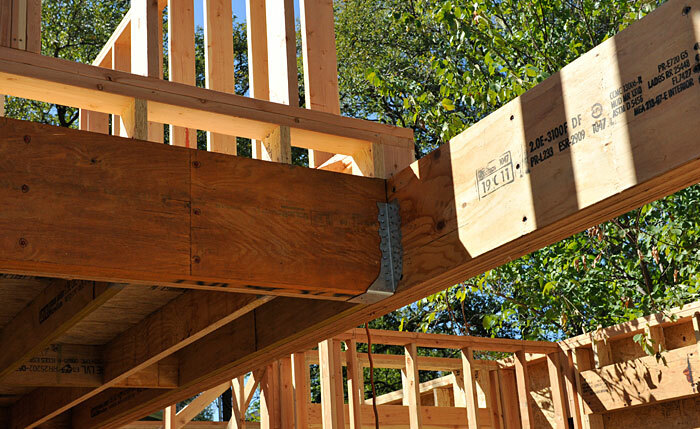 LVL is a member of the structural composite lumber (SCL) family of engineered wood products that are commonly used in the same structural applications as conventional sawn lumber and timber, including rafters, headers, beams, joists, rim boards, studs and columns. 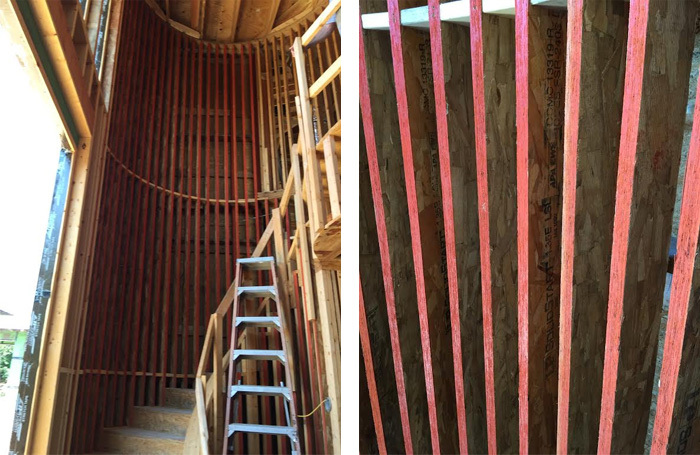 These LSLs are 24′ long and are used to make this curved wall and will not warp or bow. LSL and OSL are manufactured from flaked wood strands that have a high length-to-thickness ratio. Combined with an adhesive, the strands are oriented and formed into a large mat or billet and pressed. LSL and OSL offer good fastener-holding strength and mechanical connector performance and are commonly used in a variety of applications, such as beams, headers, studs, rim boards, and millwork components. These products are members of the structural composite lumber (SCL) family of engineered wood products. 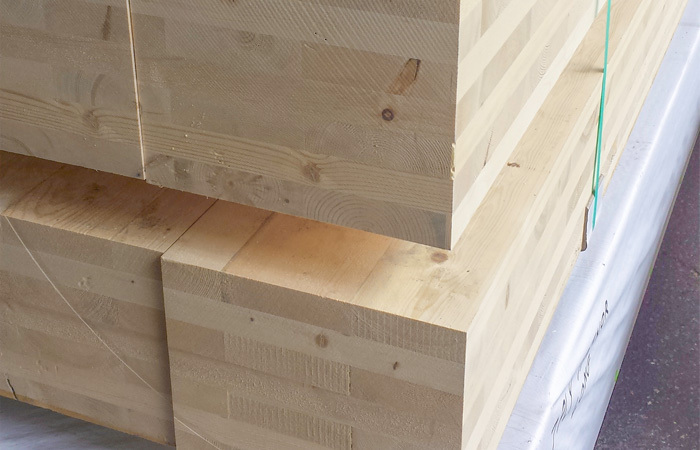 CLT is a versatile multi-layered panel made of lumber. Each layer of boards is placed cross-wise to adjacent layers for increased rigidity and strength. CLT can be used for long spans and all assemblies, e.g. floors, walls or roofs. PSL consists of long veneer strands laid in parallel formation and bonded together with an adhesive to form the finished structural section. A strong, consistent material, it has a high load carrying ability and is resistant to seasoning stresses so it is well suited for use as beams and columns for post and beam construction, and for beams, headers, and lintels for light framing construction. 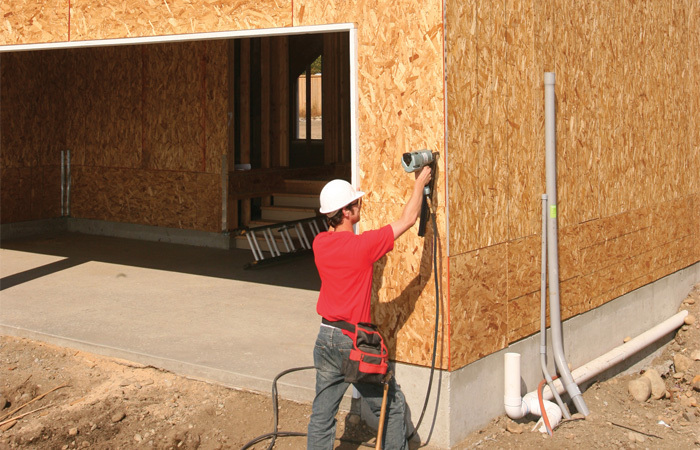 PSL is a member of the structural composite lumber (SCL) family of engineered wood products. 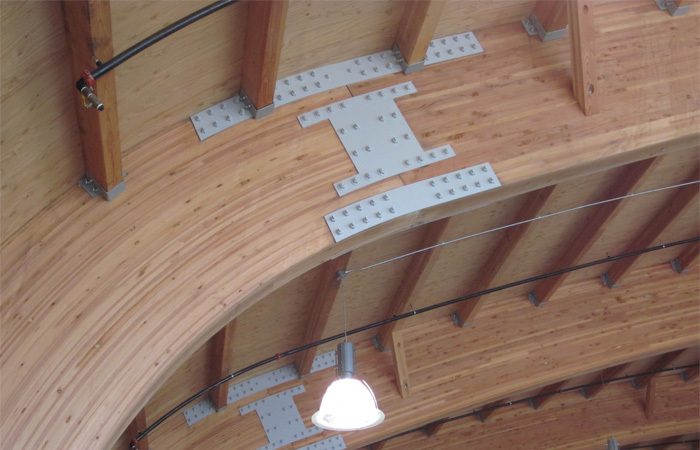 Glulam is composed of several layers of dimensional timber glued together with moisture-resistant adhesives, creating a large, strong, structural member that can be used as vertical columns or horizontal beams, as well as curved, arched shapes. Glulam is the only engineered wood product that can be produced in curved shapes, offering extensive design flexibility. 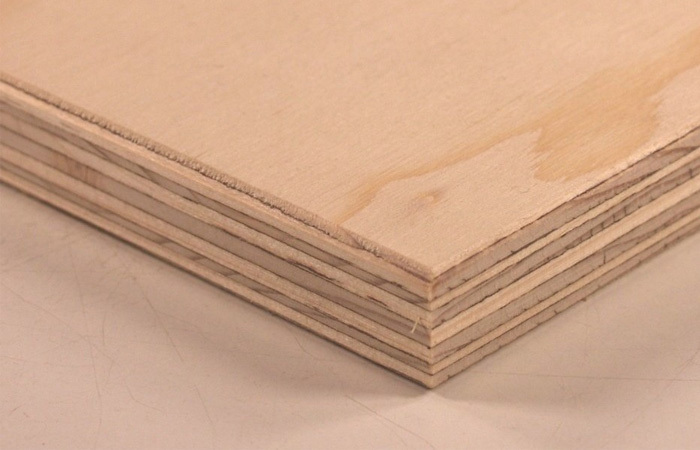 Plywood — a wood structural panel — is sometimes called the original engineered wood product. It is manufactured from sheets of cross-laminated veneer and bonded under heat and pressure with durable, moisture-resistant adhesives. By alternating the grain direction of the veneers from layer to layer, panel strength and stiffness in both directions are maximized. 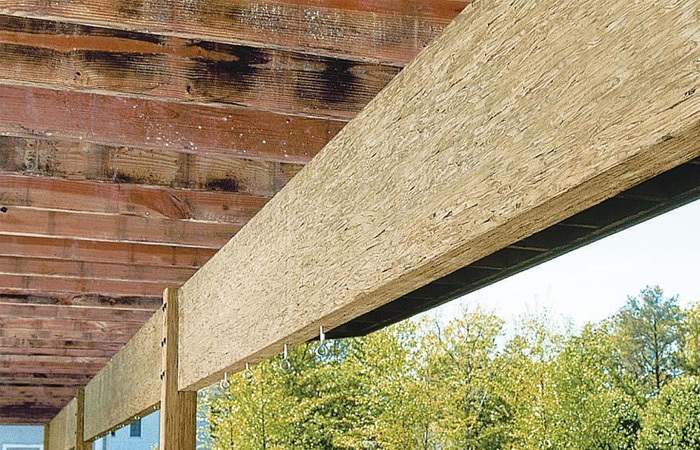 OSB is a wood structural panel manufactured from rectangular-shaped strands of wood that are oriented lengthwise and then arranged in layers, laid up into mats, and bonded together with moisture-resistant, heat-cured adhesives. The individual layers are cross-oriented to provide strength and stiffness to the panel. Produced in huge, continuous mats, OSB is a solid panel product of consistent quality with no laps, gaps or voids. “I”-shaped structural members designed for use in floor and roof construction. An I-joist consists of top and bottom flanges of various widths united with webs of various depths. The flanges resist common bending stresses, and the web provides shear performance. 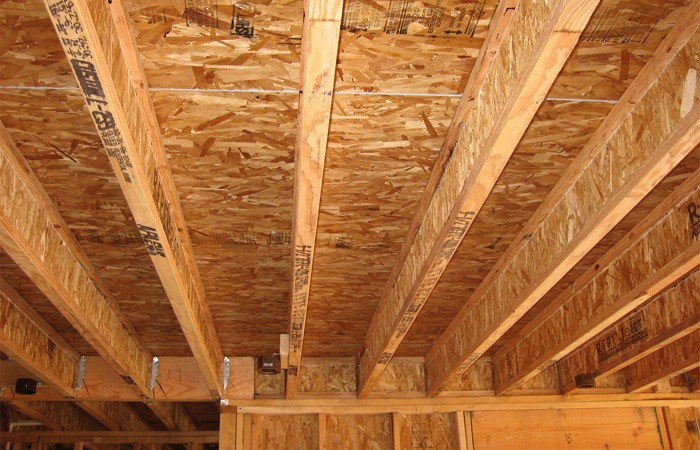 I-joists are designed to carry heavy loads over long distances while using less lumber than a dimensional solid wood joist of a size necessary to do the same task . These are structural frames relying on a triangular arrangement of webs and chords to transfer loads to reaction points.